9/4/2016Share this story on Facebook! The Office of International Programs serves as a resource for international students at IC. Currently, the college is home to about 200 international students from 55 countries. The office also assists students with study abroad opportunities. It was the year 2011. I had left Sri Lanka to travel 9,000 miles by land and sea to get to Ithaca, New York. I arrived, elated to have finally made it to America: the land of gargantuan grocery stores, Frank Sinatra, and opportunity. I was about to begin the first chapter of my immigrant story, jetlagged, in a city that never sleeps. Except, rather than the hustle and bustle of a New York City–style metropolis, I was greeted with a cold, dreary night in small-town America at the end of my 30-hour journey. Before I fully realized what had happened, I was craving the kiss of Colombo city, sunshine, and family. I had skipped the honeymoon phase entirely and gone straight to being homesick. Little did I know that the honeymoon phase would soon follow—and stay with me for the next four years. To say that Ithaca College has been transformative is a grand understatement. As an international student in the United States for the first time ever, I had a lot to fear, from the new restrictions and freedoms of this foreign country to finding a core friend group to securing the finances to make my degree possible. But the people at Ithaca College helped me through all of those fears. More than a year after graduation, the lessons instilled in me during my time at IC still guide me. From navigating a packed schedule to cruising through difficult situations and dealing with difficult people, my IC education still withstands the test of time. And the people I met at IC continue to be an important part of my circle of friends. At Ithaca College, the variety of my experiences was certainly the key to creating me, the finished product that graduated last year. Along with organic chemistry and multimedia journalism courses, I dabbled in salsa dancing. I became an RA and then a senior RA. I joined the Model UN team and attended half a dozen conferences at places like Harvard University and the University of Pennsylvania. I was an editor for the Ithacan and a news anchor for ICTV. I worked for the Towers Dining Hall, at the ITS helpdesk, and helped run campus clubs such as the Park Association for Journalists of Color and the South Asian Students Association. Not surprisingly, I was also going to bed at ungodly hours and waking up in the wee ones. In retrospect, I would not have had it any other way. I am greedy and glad that I absorbed as much of IC as I could. Yet my real education took place beyond these structured opportunities, for it was the people who truly fueled my IC journey. My obsessive need to stay busy meant I was meeting many people of all walks and virtues. Many of these people became the friends who never failed me: fellow RAs giving me midnight rides to Michael’s for construction paper, the Newswatch team coming together to make a thrilling 7 p.m. deadline, the brilliant professors ever-ready to play devil’s advocate. Today, I crave more of these experiences and people. When May 2015 arrived, I was dreading leaving Ithaca. I bid my undergraduate years a tearful goodbye and went home for the summer, having accepted a stint anchoring at a Sri Lankan national TV news network. When I returned to the United States and arrived at Columbia University, cocooned by New York City’s bright lights and towering buildings, I missed my small-town America dearly. I had left behind another family in upstate New York, and I was yearning for the quiet nights, warmed by IC friends around me. But life went on. 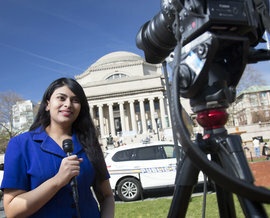 Here at Columbia, I am a multimedia reporter for NYCityLens.com, producing regular video and text stories. I am also a fellow at the Stabile Center for Investigative Journalism, which has me focusing on issues of government corruption and investigations at a local level. For example, my March 2016 piece on slashing attacks in the city found inconsistencies in statistics quoted by public officials—such as New York City’s mayor Bill de Blasio— which downplayed the frequency and seriousness of the stabbings. I have also found a knack for coding and worked on a project to understand Twitter’s algorithms using the R statistical coding language.